Andrew Skeoch and Sarah Koschak’s stunning bush block in Strangways provided the perfect backdrop to our discussions. Twenty-six landholders gathered on Sunday the 2nd of August 2015 to develop their skills in managing their property and reducing the risk of fire. Andrew Skeoch and Sarah Koschak’s 120 acre bush block in Strangways was the ideal venue and we were all inspired by the sensitive way they are protecting and enhancing the natural values. 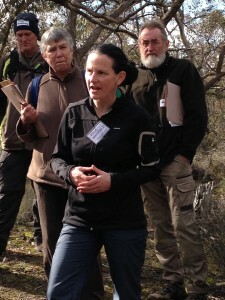 Facilitated by Chris Johnston, participants heard the perspectives of three experts including Owen Goodings (CFA – Statewide Team Leader Vegetation Management), David Cheal (Fire Ecologist, Federation University) and Julie Whitfield (Field Ecologist, Amaryllis Environmental). 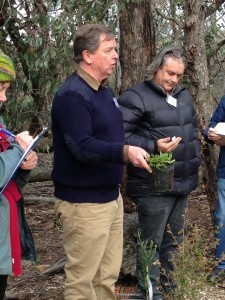 From the outset, Owen reassured participants that “you don’t need to be a expert or a scientist to understand the fire and the bush around you”. As the day progressed he provided some tips on how to better understand the bush and consider the way fire moves through the landscape. David reminded us that no land in this area is ‘pristine’ anymore and this then gives us scope to do something to enhance its values. Therefore the first thing to consider is what do we value on our properties? Through working out what is important to us, we will be able to frame our management approaches. He suggests we record the actions we undertake and, most importantly, enjoy our successes. He also informed us that while the Box-Ironbark forest can tolerate fire, but doesn’t necessarily need it to regenerate. Julie Whitford: “we have a obligation to look after ourselves but also the many other things that live on the land”. Julie reinforced that we are in a biodiversity crisis and our properties are critical in helping to conserve what is left. Giving the example of an orchid that needs a specific species of wasp to be pollinated, and a particular fungus in the soil to germinate its seed, Julie reminded us that everything is interconnected and dependent on something else and nothing exists in isolation. She recommended that we get to know our land; to learn what animals we do have, and what we could have, and then think about what we can do to bring them back. Our presenters then introduced us to a system of thinking in management ‘zones’ when considering fire and biodiversity planning. We explored three zones – furthest from the house area is the ‘biodiversity conservation zone’, closer to the house on the is the ‘interface zone’ – with modified biodiversity/ground layer, and around the house the ‘domestic zone’ with house, garden and sheds. The presenters interpreted each site or zone through their particular ‘lens’ and discussed some of the issues and considerations. We were encouraged to consider the defendable area around the home which still has huge biodiversity values such as the availability of water, flowering shrubs for bird, and rocks for invertebrates. David brought along some examples of native plants that are fire resistant species and Owen suggested planting dense tree breaks to stop preheating and slow wind. At the end of the day we went home with the understanding that we can enhance biodiversity and manage fire risk at the same time. A fabulous, thought-provoking, day. Thanks again to our presenters, facilitator Chris Johnson and our hosts, Andrew and Sarah. See below for David’s excellent key dot-points. Hately, R, 2010, The Victorian bush: its ‘original and natural’ condition, Polybractea Press. Establish your priorities – It is critical that you thoughtfully establish what you want your land to become or be. If you’re lucky enough to have them, parts may be designated as top priority for (say) Hooded Robins, other parts for dense shrubs for nesting sites for birds, other parts for fire risk reduction around your house, other parts for restoration of native vegetation & removal of shrubby weeds (such as Gorse), other parts for stock grazing. These priorities will determine which land management approaches are taken in each of the priority zones. Carefully balance your land management decisions/priorities – All decisions have upsides and down-sides. Re-establishing shrubs may greatly assist the Blue Wrens, but it works against the Magpies. Fencing to exclude Black Wallabies may greatly assist shrub regeneration, but it will also reduce habitat for the wallabies. It’s the balance, the comparison between the upsides and down-sides, that determines the best decisions. Recognize that no land is intact – All bushland is dramatically changed from pristine condition. Few blocks of bushland still support veteran trees, these are now very rare. Many blocks are over-stocked with competing saplings, which retards shrub regrowth and retards the development of mature trees. Rabbits are now ubiquitous, as are foxes and cats. 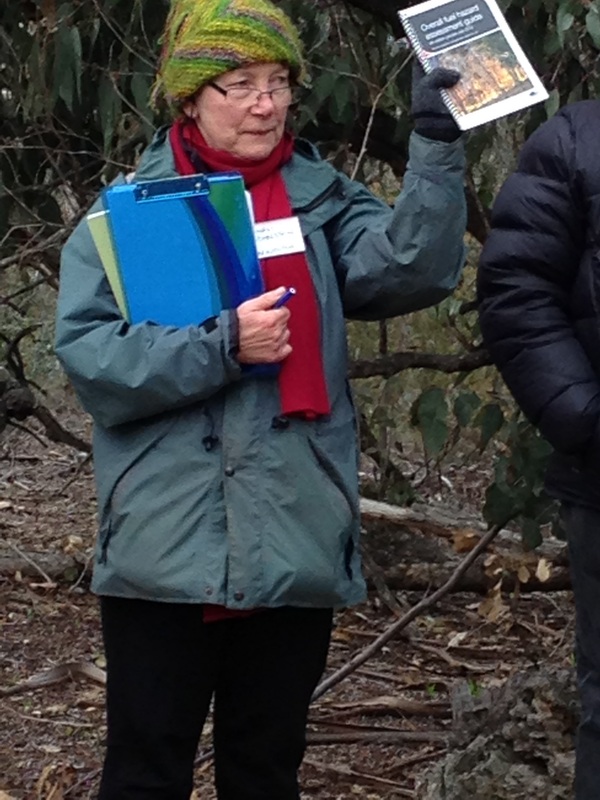 Weeds now occur in all bushland, some of these weeds can change the structure and function of bush blocks (eg. Blackberry, Gorse, Quaking Grass). 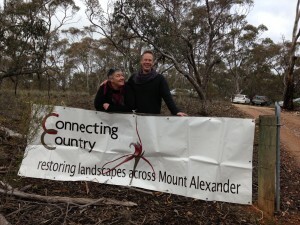 You can assist the recovery of native bushland and habitat by thoughtful intervention (eg. inplanting shrubs that have become extinct on your block, felling one in four saplings if your bushland is overstocked with regrowth, importing or favouring the development of fallen timber). Observe & record those observations and actions – In every trip into the bush or across your land you can learn something. Your soils may be different to your neighbours. Your site may have once supported stock yards. You may have few shrubby weeds, or dense stands of them. You may have a simplified shrub layer with lots of Cassinia but few other typical natives. You may note that a tree out the back has developed (nesting) hollows. Useful future directions come from these careful, site-specific observations. All outside experts & sources of information generalize. But you know your block best. 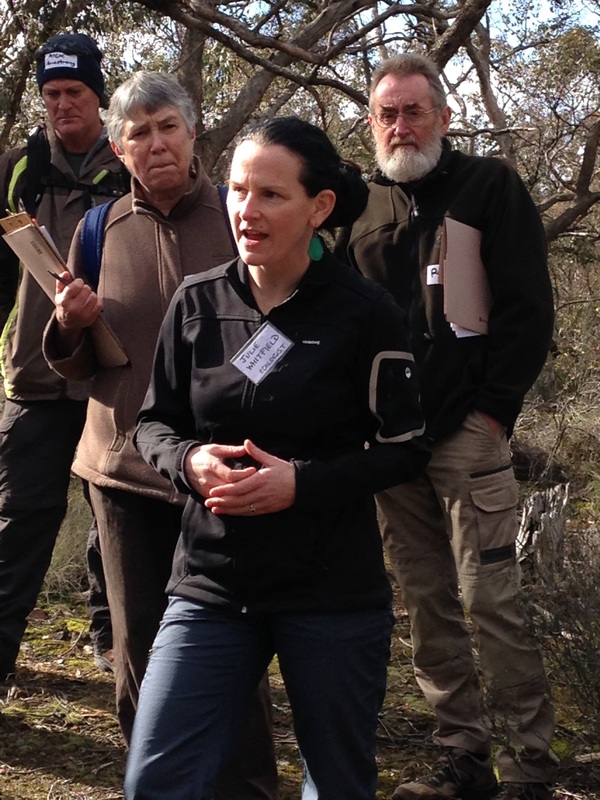 Enjoy your successes – All bush management is a case of 2 steps forward and 1 step back. Those plants you carefully planted out and died the next summer, tell you that the season was not right or the nursery stock was not right or you chose the wrong species. So, you have learnt to plant earlier in autumn, or buy tube stock rather than advanced plants or choose something else that works better on your site. That’s a positive outcome, some useful learning. But also rejoice in your successes. Sum them up in your mind in the evenings. Tell your family, friends & neighbours. Write a note for the Connecting Country website to share with others. Take pleasure in the successes. Remember – If you are allowed to make mistakes, you are sure to succeed (attributed to Renan) or On the other hand, you have different fingers (attributed to ‘Larry’). Is it possible to have biodiversity and to manage for fire risk? 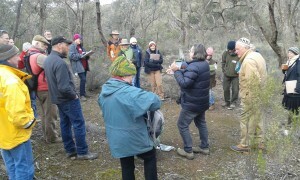 This is what Newham Landcare members Ian and Helen Scott and Penny Roberts learnt from Connecting Country’s ‘Living with Fire and Wildlife‘ workshop on a 110 acre bush block in Box Ironbark country near Yandoit on Sunday 2nd August 2015. Learning by experience was the order of the day. By taking practical steps to better manage vegetation, minimise fire danger and maximise biodiversity (flora and fauna), we learnt how to interpret landscape on different sites around the property. But first, about 20 participants from various parts of central Victoria introduced ourselves by describing in a word what we felt about fire management on our properties. The most repeated comments were “conflicted”, “confused”, and “ready to leave”. We then listened to three experts before walking to the 3 sites which were “in the bush”, “bush modified” (regenerating, with fences to exclude pest animals), and the “house zone” with vegetable/flower gardens and hard landscaping. Three main zones at increasing distance from buildings were described. Within the near zone up to twenty metres from buildings, hard surfaces such as paths predominate, and food may be produced. In the intermediate or “Modified” zone, from twenty to forty metres from a building, vegetation is modified and selected for low volatility and low density. In the furthest “Bush” zone from forty metres onwards, vegetation is connected for biodiversity. These assessments also depend on slope, and whether the vegetation is grassland, woodland or forest. Vertical connectivity. If burning vegetation is arranged closely, lower layers will preheat and then ignite upper layers, making the fire more intense. Horizontal connectivity. A dense tree canopy, or dense surface fuel cover provides continuity of fuel, which will preheat and ignite vegetation downwind more readily than when there are gaps between plants. It was surprising to appreciate that although we were in what looked to us like high-risk vegetation, it was sufficiently sparse and disconnected for risk to be relatively low. Horizontal separation. Avoid having shrubs near the house, especially tubs near windows. Trees of low volatility e.g. Blackwoods (Acacia melanoxylon), can be used as a barrier to wind and thereby moderate fire speed, radiant heat and catch embers. David Cheal (Fire Ecologist – ex-DEPI and now Federation University) made the point that there is no such thing as a pristine or intact landscape, as it was before human interference. All bushland has changed. Understanding that, we need to arrive at and balance our land management priorities recognising our own values, using evidence and facts rather than opinion. David said we should recognise the up-sides & down-sides, observe, record our actions, rejoice and share in successes and learn from failures. How many of us have lost plants that were not right for our patch, or planted at the wrong time? Succulents/Chenopods, Bluebush (Maireana sp.) and Saltbush (Atriplex & Rhagodia sp. ), Pomaderris, some Acacias, Eremophilas, Myoporum, Brachychitons (Kurrajong/Bottletree). Family Myrtaceae (some Eucalypts, Melaleuca, Callistemon), Rutaceae (eg Boronia, Philotheca), Mint bushes (Prostanthera), some Cassinias, and exotic grasses/weeds. Julie Whitfield (Field Ecologist, ex-DEPI and now Amaryllis Environmental) described the alarming level of species decline going on all around us; endangered species are at a crisis point. She explained how the creatures we are aware of represent a small percentage of species that are present, particularly the invertebrates. She described the way that several species are entirely dependent on just one other species for their survival. This interconnectedness means that whilst we acknowledge the decline of one species, we fail to read the effects on other co-dependent ones. Morning tea and lunch helped us not to freeze. After lunch we broke up into groups and chose locations N, S, E & W of the house to test our new knowledge in identifying risk, fuel levels and arrangement, biodiversity values, actions we would take or avoid, in managing the zones. The experts assisted in these deliberations, and each group shared its findings. We left with session notes and handouts and useful follow-up web-based resources, feeling much better informed about land management practices that will minimise fire danger and maximise biodiversity on our properties.